Photos courtesy of StoneWall Select from ICD Corp.
Segmental retaining walls consist of modular concrete blocks that interlock with each other. They are used to hold back a sloping face of soil to provide a solid, vertical front. Without adequate retention, slopes can cave, slump or slide. With the unique construction of segmental retaining walls, higher and steeper walls can be constructed with the ability to retain the force of lateral earth pressure created by the backfill soil. 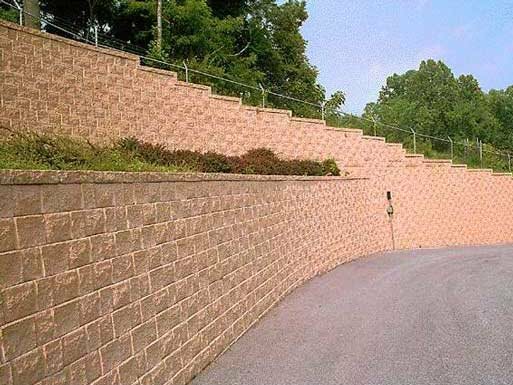 Segmental retaining walls can be installed in a wide variety of colors, sizes, and textures. They can incorporate straight or curved lines, steps, and corners. They are ideal for not only slope support, but also for widening areas that would otherwise be unusable due to the natural slope of the land. Retaining walls are often used for grade changes, and for other functional reasons such as widening driveways, walkways, or creating more space in a patio outdoor area. Segmental retaining walls consist of a facing system and a lateral tieback system. The facing systems usually consist of modular concrete blocks that interlock with each other and with the lateral restraining members. The lateral tiebacks are usually geogrids that are buried in the stable area of the backfill. In addition to supporting the wall, the geogrids also stabilize the soil behind the wall. These two factors allow higher and steeper walls to be constructed. Some segmental systems use steel or fiberglass pins, clips or integral lips to create a continuous facing system. Some blocks are hollow, some are solid. Just about all block systems permit backfill drainage through the face joints. Retaining walls can be constructed of many different materials and with a variety of building techniques. This discussion will focus on segmental retaining walls as the structural material, but monolithically poured concrete walls, steel, timber, used tires, and reinforced soil are often used too. In most states, retaining wall designs taller than about 4 feet must be designed by or approved by a qualified, licensed professional engineer. Additionally, it is important to check with and adhere to local building codes prior to any construction, even when walls are shorter than four feet. Retaining walls are, and should always be viewed as load bearing members first, and aesthetic groundscapes second. 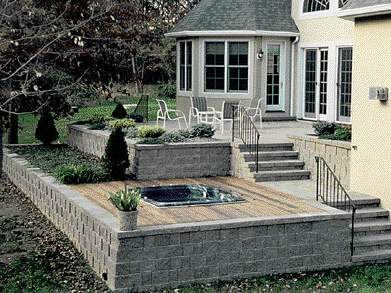 Retaining wall design and wall type selection is driven by several factors. These factors include cost, required wall height, ease and speed of construction, ground water conditions and soil characteristics. Ultimately, all retaining walls serve to hold back a vertical or near vertical face of soil that would, without adequate retention, cave, slump or slide to a more natural slope. 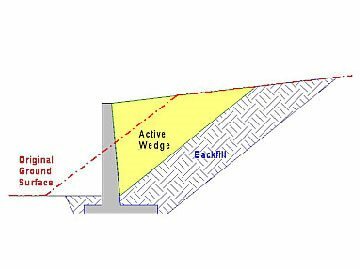 Designing any retaining wall requires a knowledge of lateral earth pressure, the pressure developed by the backfill. It is the force generated by the lateral earth pressure that constitutes a large part of the load that the wall must carry. Once the lateral earth pressures are known, the wall is checked for stability. This includes checks for wall overturning, base sliding, and soil bearing capacity failures. Improper wall design and installation results in failures of retaining walls. By understanding how a wall works, and how it can fail, it is possible to engineer a retaining structure that will meet all foreseen environmental, structural and construction demands. One area that can be commonly overlooked, or at least underestimated, is the necessity to drain the backfill of rainwater and/or groundwater. Hydrostatic pressure can cause or induce retaining wall failure, or at least damage the wall. Drainage of water as a result of rainfall or other wet conditions is very important to the stability of a retaining wall. Without proper drainage the backfill can become saturated, which has the dual impact of increasing the pressure on the wall and lessening the resistance of the backfill material to sliding. Granular backfill material offers the benefits of good drainage, easy compaction, and increased sliding resistance. Drainage systems usually utilize weepholes and drainage lines. Weepholes actually penetrate the retaining wall and drain the area immediately behind the wall. Weepholes should have a minimum diameter so as to permit free drainage; for large walls, 4-inch weepholes are common. Adequate spacing between weepholes allows uniform drainage from behind the wall. Weepholes should always have some kind of filter material between the wall and the backfill to prevent fines migration, weephole clogging, and loss of backfill and caving. Drainage lines are often perforated and wrapped in geotextile or buried in a granular filter bed, and serve to carry water to the weepholes from areas deeper within the backfill. 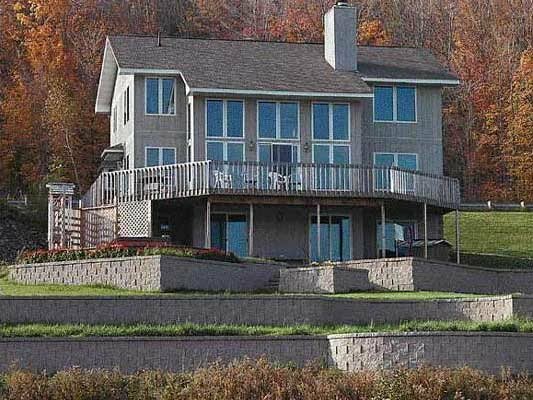 Segmental retaining walls are constructed without mortar or concrete footings. Instead, the retaining wall units are simply stacked on a shallow, granular leveling pad. This method creates walls that are easy and economical to install. The walls are structurally stable, yet they remain "flexible" to tolerate minor earth movement without damage. Segmental retaining walls offer many advantages, including rapid construction, horizontal and vertical curvatures, easy grade changes, a wide variety of colors, and sizes and textures. Some segmental systems use steel or fiberglass pins, clips or integral lips to create a continuous facing system. Some blocks are hollow, some are solid. Just about all block systems permit backfill drainage through the face joints. When the weight of units alone is not enough to resist soil loads, horizontal layers of geosynthetics are used to reinforce soil behind walls. With proper soil reinforcement and design, segmental retaining walls can be constructed to heights in excess of 40 feet. An engineer should be consulted for the correct use of geogrids. Very high loads can be supported with this type of construction. 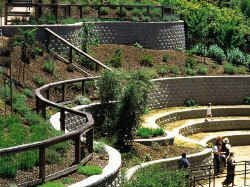 StoneWall Select offers a myriad of installation instructions including corners and curves, geogrid installation, capping options, and application options. Click here to see the installation process for a variety of applications.